Ireland’s Department of Justice says that there has been a surge in the number of applications in 2013 and most of the applicants are from China, Russia and India. In the year 2013, there was a surge of 14 per cent since 2011 and 95,000 Ireland visa applications were made. According to the Department of Justice, the top countries applying for Ireland visas were China at 11 per cent, Russia at 15 per cent and India at 16 per cent. The figures of Department of Justice show that, in 2013, there were 97,000 renewed or new registrations for permission to live in Ireland, and new visa applications of a further 95,000 were made, out of which 91% were approved. With 18 Irish Citizenship ceremonies held during the previous year, more than 30,000 Irish Citizenship applications were also decided in 2013. However, there were unlawful residents living in Ireland and almost 2,250 people were removed or deported from Ireland in 2013, while as per the Provisional figures, 425 people decided to leave Ireland voluntarily rather than receiving a deportation order. 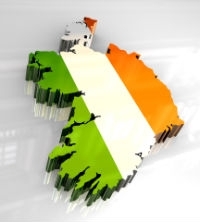 Alan Shatter, Minister for Justice, has confirmed that 544,000 people i.e., 12% of the population in Ireland are now non-Irish making the country more and more diversely cultured.